Event Organiser offers the most comprehensive, and yet easy to use, event and calendar plug-in for WordPress. Complex event recurrence schedules, multi-day events and the ability to add or remove individual dates are all available in the free version. Collect booking payments with Pro offline or via PayPal. Other available gateways include Stripe, Authorize.net and iDeal. 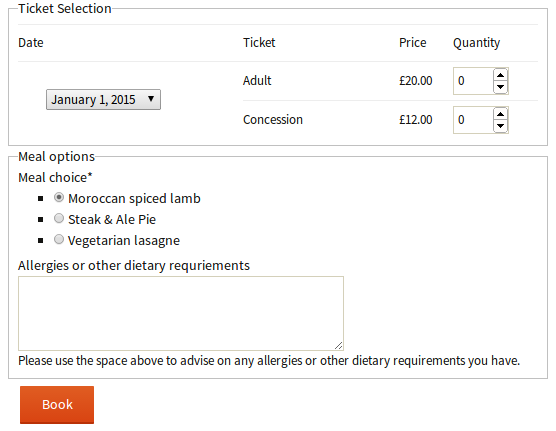 Tailor the booking form to your needs by adding your own fields via the form customiser. Event Organiser is built with developers in mind. Templates can be easily replaced, and WordPress hooks allow you to modify the plug-in’s behaviour. The codebase is extensively documented with a function reference, hook reference and user documentation. With extensions ranging from gateways to discount codes, and iCal sync to front-end event submissions – Event Organiser can meet the needs of almost any user. By purchasing Pro Business or Developer license, you’ll get extensions included for free. With over 770,000 downloads and a 94% rating you can have confidence in Event Organiser to power events and bookings on your site. It packs a host of features and yet maintains an impressively simple and user-friendly interface, making event management easy. But don’t take our word for it, check what people are saying.